There have been many weather applications going around recently, MyWeather Mobile is another good one. At $3.99, MyWeather Mobile is a bit cheaper than most feature rich weather applications, and also has a free, lite version. The application gives you current sky conditions (including wind chill/speed/direction, dew point, humidity, precipitation, and barometric pressure), personalized city selection, as well as your 7 day forecast. 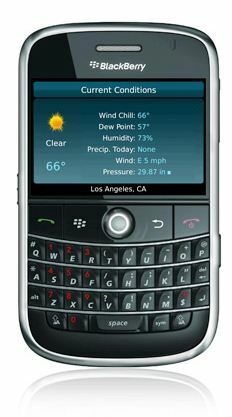 MyWeather Mobile also uses Microsoft Virtual earth, allowing you to pan, scroll and zoom the animated radar to a variety of points of interest, making it the best radar on a BlackBerry that I have seen. Another nice feature is the 36 hour trend graphs, giving you detailed information on recent conditions and precipitation. Overall I think MyWeather Mobile is a good application, is priced very well, and has one of the best animated radars out there. However, it is lacking that wonderful BerryWeather homescreen integration. MyWeather Mobile is only available in the U.S.A. and is compatible with the 9530, 9550, 83xx, 81xx, 9000 and coming soon to the 9630 and 8900. Click the links below to download via BlackBerry App World.